Thailand Approves Controversial Military-Penned Constitution : The Two-Way Thai voters have overwhelmingly backed a new constitution in a referendum. The document's critics have called it a step backward for Thai democracy, while supporters say it provides stability. 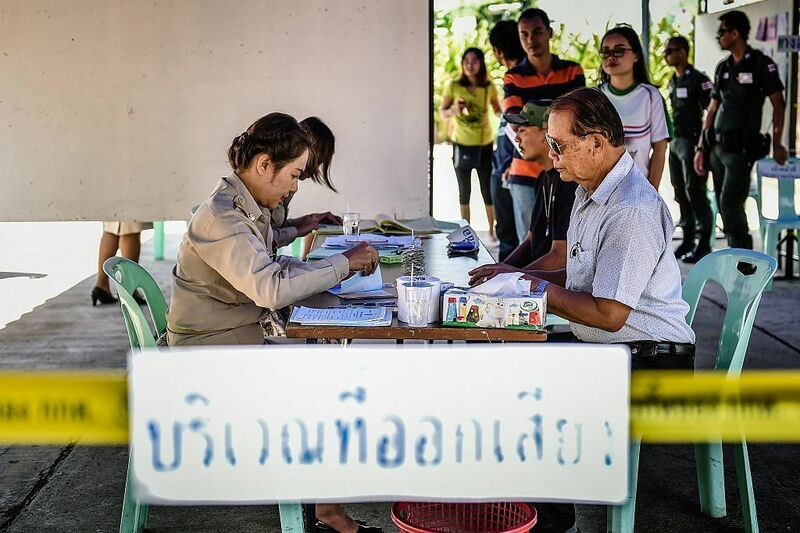 People register to vote at a polling station before casting their ballots in the constitutional referendum in Thailand's northeastern province of Buriram on Sunday. Thai voters have overwhelmingly backed a new constitution drafted by the military government. The document's critics say it enshrines the power of the military in a way that is harmful for Thai democracy, while supporters argue it provides stability to the country. "The Thai military seized power from a democratically elected government two years ago, promising a return to clean governance and political stability," reporter Michael Sullivan, who is in Bangkok, tells our Newscast unit. But, he adds, opponents of the charter say it dilutes "the power of elected officials in a watered down form of democracy." It passed by a wide margin, Sullivan reports. "With more than 90 percent of the vote counted, the Thai election commission says roughly 60 percent of those who cast ballots voted for the new constitution while roughly 37 percent voted against it," he says. In essence, this constitution will "lay the foundation for a civilian government influenced by the military and controlled by appointed rather than elected officials," as The Associated Press reports. Independent election observers had asked to monitor the poll, "but this was not granted by the Election Commission," as the BBC reports. And "public discussion or criticism of the proposed constitution was banned by the junta in the run up to today's vote," Sullivan says. "The junta has deemed criticisms and dissenting opinions about the draft constitution to be 'false information' and a threat to national security. As a result, the only sources of information for many voters about the draft constitution now come from government agencies – all of which have taken the position that the proposed constitution would benefit the Thai people." The limitations on public debate have had an impact on public awareness of the charter — indeed, as the BBC's Jonathan Head reports, "many Thais say they have little idea what is in it." During voting, one student activist was arrested after destroying his ballot in protest while shouting, "Down with dictatorship and long live democracy," as the AP reports. Destroying voting documents is illegal, the wire service adds, and "at least 20 other people were detained for destroying their ballots, apparently accidentally because they were confused about the voting procedure." Prime Minister Prayuth Chan-ocha had said "he has no plans on stepping down if the new constitution is rejected," and "he still plans on holding a general election next year," as Sullivan reports.